WILLISTON, S.C. – March 20, 2019 – Crane Merchandising Systems, a Crane Co. company and the leading global manufacturer of innovative solutions for vending equipment, enterprise software, cashless systems, and wireless communications, collaborated with NAMA and General Mills in honor of National Vending Day to raise awareness for Operation Homefront, a nonprofit organization that supports military families. 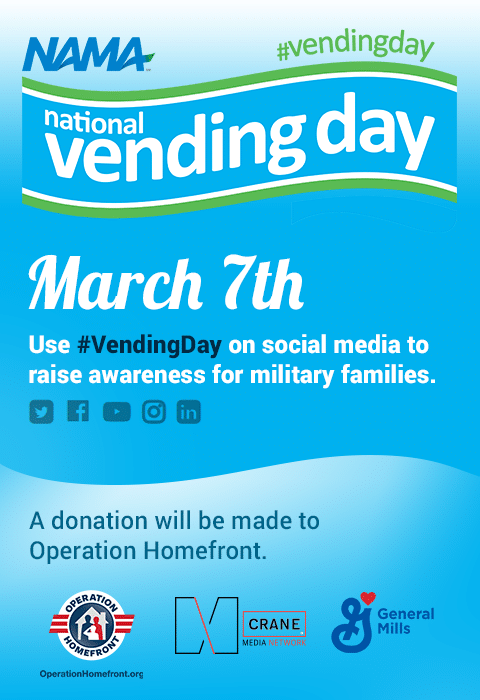 The three day campaign ran on over 30,000 screens nationwide and featured a message encouraging consumers to share their positive vending experiences on social media using #VendingDay. More than 2.1 million people engaged with the message and their social media activity drove awareness and thousands of dollars in donations to Operation Homefront.